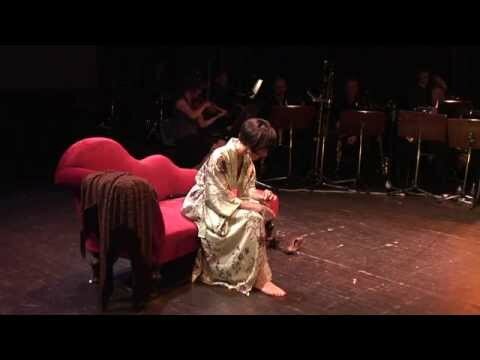 Anaïs Nin is a ‘monodrama’, a musical stage play for one voice (Cristina Zavalloni), an ensemble of eight musicians (unconducted) on stage, and projected film fragments. The voice, Anaïs Nin, sings of her love affair with her father, the composer and pianist Joaquín Nin, whom she meets again after an absence of twenty years. 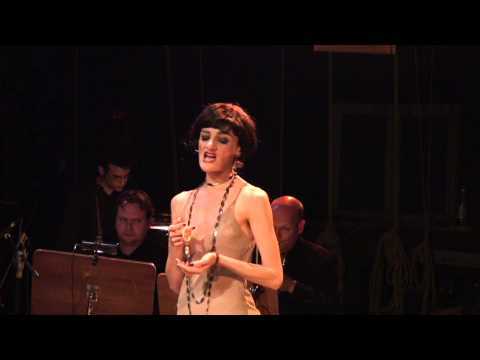 Her lovers, René Allendy, Antonin Artaud and Henry Miller, get their word in both on film and on tape, recorded by the expressive singer Han Buhrs. These films are a compilation of existing material as well as new fragments. We see Anaïs Nin and Antonin Artaud making a romantic walk. On stage Nin sings of her ‘night of ecstasy’ with him.